`We often get asked when the best time to run a crowdfunding campaign is and the truth is you should run your campaign once you’ve done the prep work. Pro tip: the earlier you start prepping the better. The next question is - what goes into planning a crowdfunding campaign? So we’ve compiled some steps you can take now in preparation for a crowdfunding campaign in 2019! 1. Take advantage of our free resources to learn the crowdfunding basics. If you haven’t taken our free Crowdfunding Basics Webinar, that’s the best place to start. We cover everything you need to know about crowdfunding on iFundWomen. From the different reasons women are raising money on our platform to how to build a strong rewards strategy that doesn’t cut into your profits. Like to be extra prepared? Check out our Campaign Guide and come to the webinar with questions to ask our coaches! 2. Build up your email list. The larger your network, the more money you’ll be able to raise, so start building now! Go to networking events, join online communities, and treat yourself to a co-working space membership (because IRL connections are where it’s at). Start telling your friends and family about your campaign early on. Encourage people to join your email list to stay in the know and keep them updated on your progress. Then, when your campaign goes live, they’ll be ready to support you! Your pitch is the foundation of your marketing strategy for your campaign (and your business). You need to be very clear on the problem you are solving and how your product or service solves this problem. The more you practice, the more confident you’ll feel and sound when you’re ready to start asking for money. People want to be able to believe what you’re saying so don’t give them any reason not to. If you know you can’t hone alone, get out there and find professionals who can help you. What do you need in order to crowdfund on iFundWomen? You need to have a website along with a style guide and social handles. Establish your presence and make sure your brand is consistent. Need some help with this part? We have a ton of marketing, branding & social media specialists within our network. Join our Slack network and let the community know what you need. As you start planning when to launch your campaign, set attainable, actionable goals for yourself. Choose a target number for your email list, the amount of events you want to attend, and followers on your social media. What is the minimum amount I need to raise to execute the next step for my business? If you’re manufacturing the first order of your accessories line, how much do you need for an initial production run? If you’re launching an online course, what’s the minimum amount you need to develop and publish that content? What is the size of my network? If you know 100 people, you probably shouldn’t set a goal of $300K. Instead, if you know 100 people, and on average you think they’ll contribute $50, somewhere around $7K is going to be a great place to start. Luckily, we have an amazing, free tool that you can use for all of this planning: Our Coaches Playbook. Use it to write out your pitch, evaluate your network, build a rewards strategy and determine an appropriate goal amount. 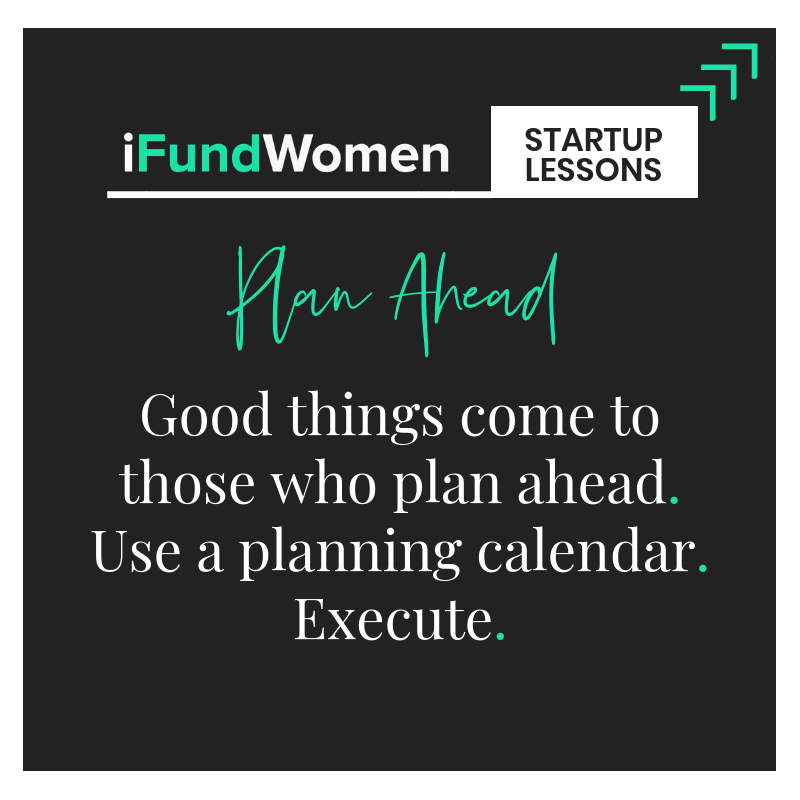 Bonus: Sign up for iFundWomen for more tools and support!